So the last time I showed you some knitting I really hadn't done so well. 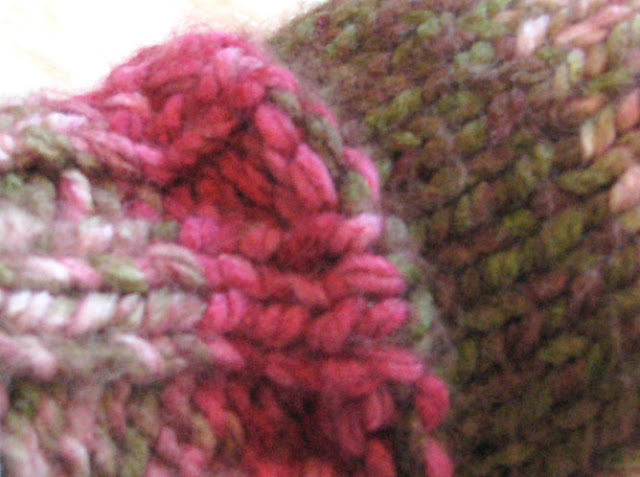 I actually began knitting again right away otherwise I was afraid I'd never do it again. This time I did follow a pattern, a very simple one,﻿ but I am already thinking about how to alter it! This is only a sneak peek as it is not completely finished yet but I am very pleased with the results. And when I found this yarn I knew exactly what I wanted to make. I think I'll be taking a break from making baby hats for awhile though. There is not much for me to post right now as I am getting ready for finals this week and preparing for my daughter's 13th birthday celebration next weekend. I am having some real encaustic withdrawals too! When I went back to use my own, very inadequate, "encaustic" I was frustrated because it just wasn't the same as when I did the workshop. The difference between using the real stuff and my pathetic imposter wax is painfully obvious to me now. So I will busy myself with other projects until I can invest in some real encaustic supplies! It's so nice to "see" you! I love that yarn! We have state testing this week so I am trying to think of ways to keep the spirits soaring! Happy Birthday to your sweet 13 year old! My kids did the state testing last week. Not fun for them but there was almost no homework so they were excited about that! And I will tell Rose you wish her a happy birthday!